Comics are a visual medium, but so often criticism of the medium hinges on narrative, ignoring or minimizing the visual storytelling and unique structures that make comics so different from cinema and photography. We’ve decided to change that up with a feature that we’re calling Anatomy of a Page, in which we explore pages and panels that showcase the language of comics and how the best visual storytellers maximize the freedom of comics in order to tell stories that can’t be told anywhere else. Today’s Anatomy of a Page is devoted to a sequence of parallel pages in Sloane Leong, Claire Gibson and Marian Churchland’s From Under Mountains, a new fantasy series from Image that splits its time between three protagonists of different backgrounds. I don’t think I’ve highlighted any female creators since I started writing Anatomy of a Page, and that’s stupid. So, let’s pull triple-duty here and talk about the most ambitious and interesting comic I read this week, From Under Mountains #1, from the tripartite female team of Sloane Leong, Claire Gibson and Marian Churchland. A character rides off beyond the gates, towards the sky, surrounded by birds as Elena looks on, and she then receives a final beat of silence all her own to end the page. Now here’s the top of the very next page. Obviously this is a beautiful establishing shot that transitions us to another character’s arc. With the way Leong deploys colors and, well, mountains, there’s really no need for those three slivers of aspect shot. But that doesn’t mean they’re not a stand-out artistic and narrative decision, because they are. There are two things (among many) worth pointing out here. First, as always, I’m a sucker for aspect panels, especially when they’re deployed somewhat unconventionally and to a meaningful effect. Here, aspect shots of the seafoam-ish green sky dotted with birds of which we had a glimpse on the previous page are superimposed over the luscious blue skies on the new page. The skies are brought together as a means to both transition and to contrast, but the contrast doesn’t end there: both of the scenes pictured have characters looking out towards something. Again, even without the aspect panels, there would be a parallel here; but, it would be sort of a thin parallel if not for the way the aspect panels of the sky in Tova’s scene force us to visually hearken back to the sky they represent from Elena’s scene. And that’s all just the first thing worth pointing out. The other thing that grabs me about this little page-to-page ditty is that it is but one instance of two visual motifs—birds and the sky–that are incredibly important to the visual manner in which this story is told. I don’t want to spoil too much of this comic, since the best way to experience the visual motifs of this comic (or any good comic, really) is to, you know, read the whole thing from start to finish yourself. Let me just show how important the time of day is, visually, in this comic. See that lavender color that serves as the backdrop for this page? That was the color of the sky in the final panel of the previous page, which is, again, explicitly connected to this page not just through the color motif but through the initial aspect panel of Elena looking out with her eyes obscured by nothing other than–you guessed it–a bird. Of course, this page is clever even if you set aside the tightly sunset-themed color work. 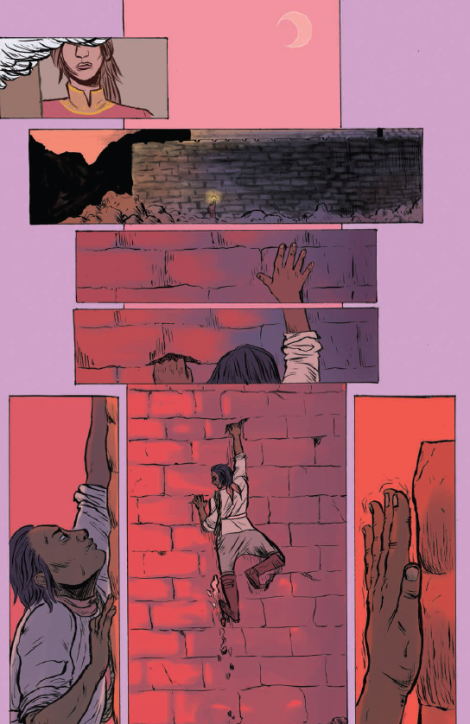 Tova climbs the wall as Leong places the moon at the top and does everything to give us a sense of height on this page. But the time of day in this page as presented by the color which the sun lends to the scene, as with many other pages in this book, is inextricably linked to the readers’ experience of it. Any comic in which creators take the time and care to figure visual motifs into their narratives is special. 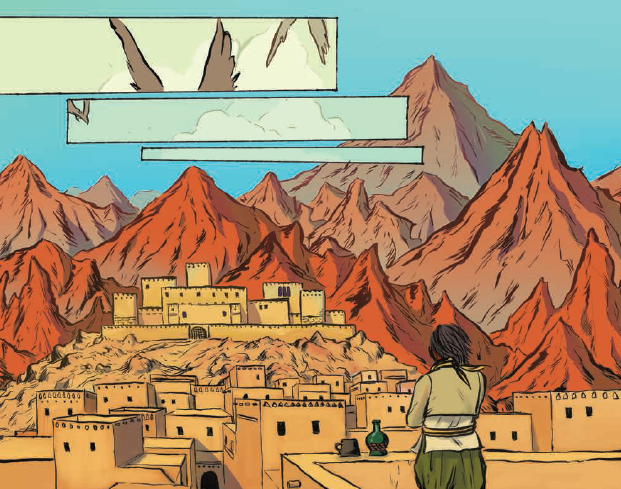 What made From Under Mountains #1 stand out to me was how simple and clear these motifs were, and how effective they were at giving the reader a sense of time and place while maintaining a sense of intimacy with both the locations and the characters within them.